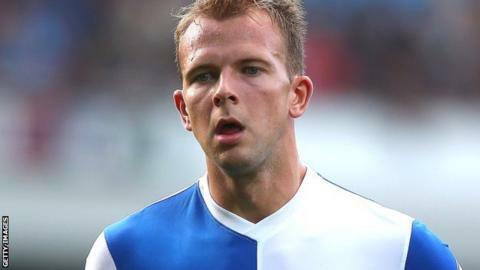 Jordan Rhodes grabbed his 50th league goal for Blackburn Rovers to help them to victory over fellow play-off hopefuls Ipswich Town. Both sides had chances in the first period but it was the hosts who went ahead when Rhodes scored against his former club with a superb low shot. Rudy Gestede sealed the win late on with a close-range header. Rovers are still seven points off the play-off places but are now just two points behind Ipswich. The Tractor Boys will rue a missed opportunity to stay within one victory of the top six having had several decent first-half opportunities. They should have been ahead after 26 minutes when Daryl Murphy headed over with the goal gaping following a Jonathan Williams cross, while Williams also forced a fine save from goalkeeper Paul Robinson. At the other end Tom Cairney went close with a bending effort that Dean Gerken did well to save and the away goalkeeper also had to be at his best to tip away Michael Keane's glancing header. Williams was the most likely source of an Ipswich goal and again went close with a low strike after a superb run and Robinson then pulled off an acrobatic save to tip away Frank Nouble's long-range strike. But it was Rovers who went ahead just past the hour when Rhodes latched on to Gestede's clever flick and found the bottom corner with a powerful strike from the edge of the area. Gestede should have made it two only to shoot wildly over, but it did not matter as he made amends by heading in Craig Conway's free-kick through a flurry of players. "I thought it was an outstanding goal. A through-ball from Rudy and he's took it with his left foot and it's a fantastic finish. "I think we were equally as good or equally as bad as the opposition up until that goal went in because it wasn't a great game. But it's an £8m striker's goal. "We've got to come back and do it again. Six games to play, see how many points we can get. "We're not in the best position to get in the play-offs. Reading are in that and it's theirs to lose now." Match ends, Blackburn Rovers 2, Ipswich Town 0. Second Half ends, Blackburn Rovers 2, Ipswich Town 0. Attempt blocked. Tom Cairney (Blackburn Rovers) left footed shot from outside the box is blocked. Attempt missed. Daryl Murphy (Ipswich Town) left footed shot from outside the box misses to the right. Assisted by Tommy Smith with a headed pass. Attempt blocked. David Dunn (Blackburn Rovers) right footed shot from outside the box is blocked. Attempt blocked. Tom Cairney (Blackburn Rovers) left footed shot from outside the box is blocked. Assisted by Luke Varney. Substitution, Ipswich Town. Paul Green replaces Luke Hyam. Frank Nouble (Ipswich Town) wins a free kick on the right wing. Substitution, Blackburn Rovers. David Dunn replaces Rudy Gestede. Attempt blocked. Sylvain Ebanks-Blake (Ipswich Town) right footed shot from the centre of the box is blocked. Assisted by Jonathan Williams. Goal! Blackburn Rovers 2, Ipswich Town 0. Rudy Gestede (Blackburn Rovers) header from the centre of the box to the bottom right corner. Assisted by Craig Conway with a cross following a set piece situation. Substitution, Blackburn Rovers. Luke Varney replaces Corry Evans because of an injury. Attempt missed. Rudy Gestede (Blackburn Rovers) right footed shot from the centre of the box is too high. Assisted by Jordan Rhodes. Attempt missed. Jordan Rhodes (Blackburn Rovers) right footed shot from the left side of the box misses to the right. Assisted by Thomas Spurr with a cross. Substitution, Ipswich Town. Sylvain Ebanks-Blake replaces Anthony Wordsworth. Corner, Blackburn Rovers. Conceded by Luke Chambers. Rudy Gestede (Blackburn Rovers) wins a free kick on the right wing. Attempt missed. Tom Cairney (Blackburn Rovers) left footed shot from outside the box is too high following a corner. Attempt blocked. Michael Keane (Blackburn Rovers) left footed shot from outside the box is blocked. Assisted by Tom Cairney. Corner, Blackburn Rovers. Conceded by Christophe Berra. Goal! Blackburn Rovers 1, Ipswich Town 0. Jordan Rhodes (Blackburn Rovers) left footed shot from the left side of the box to the bottom right corner. Assisted by Rudy Gestede with a headed pass. Attempt saved. Daryl Murphy (Ipswich Town) header from the centre of the box is saved in the bottom left corner. Assisted by Aaron Cresswell with a cross.